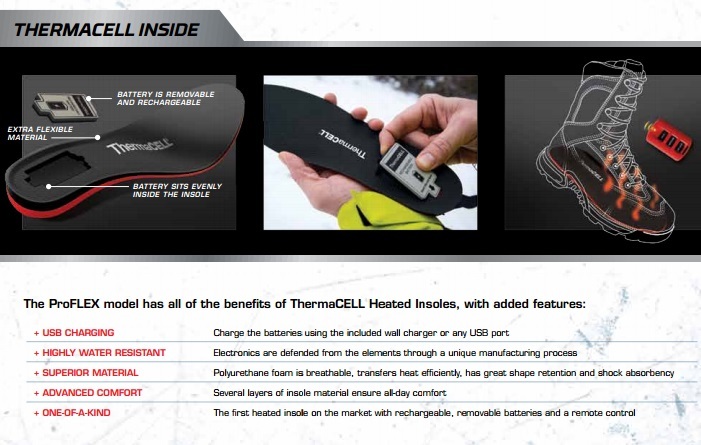 ThermaCELL Proflex Rechargeable Heated Insoles with Remote. Thermacell ProFLEX Heated Insoles are the newest revolution in cold-weather comfort technology. Now you can enjoy the benefits of the ThermaCELL Heated Insoles even longer with ProFLEX removable, rechargeable batteries. Simply swap out the batteries to extend the heated comfort without removing the insoles from your boots or shoes. Keep your feet warm and toasty in the bitter cold weather with ThermaCELL ProFLEX Rechargeable Heated Insoles. Utilizing high-tech wireless technology and thermal heating elements, these great insoles keep your feet warm and comfortable for up to five hours per charge. Controlled by an easy-to-use remote control, the insoles offer three temperature settings: High (111\xC1F), Medium (100\xC1F), and Off (no heat). Removable Battery: Charging your Heated Insole battery couldn\xCDt be simpler. Remove the cushion-covered battery without removing the insole. Replace with an additional battery pack(sold separately) to keep feet heated while you recharge. 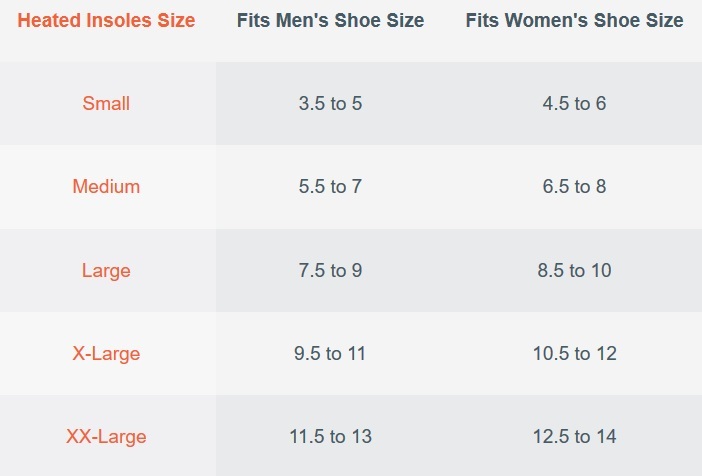 Flexable Insoles: Made of durable Polyurethane foam, the ProFLEX model easily fits into a variety of footwear and has increased flexibility for added comfort and mobility.